If you think the iOS app ecosystem is big now, as it pushes some 600,000 apps available for iPhone and iPad, just imagine how big it could become if Apple made good on this newly filed patent application titled “Content Configuration for Device Platforms.” The application describes a way for non-developers to create iOS apps using a simple, graphical interface. Of course, it’s just a patent application, and Apple files tons of these things. So you can’t point to it and call out what it describes as a confirmed, forthcoming feature for the iOS platform. But an Apple-provided DIY app building tool does makes some sense in terms of a way to envision the future of mobile computing. Remember, there was once a day when only “webmasters” could set up and maintain webpages. Now everyone just starts a Tumblr to share their thoughts with the world. Why shouldn’t everyone have the opportunity to try their hand at app creation, too? Obviously, non-programmers today can build apps through the use of third-party app building services, but most mainstream users don’t know about those. Apple introducing a basic app builder of its own would serve to raise awareness about the existence of these kinds of tools. 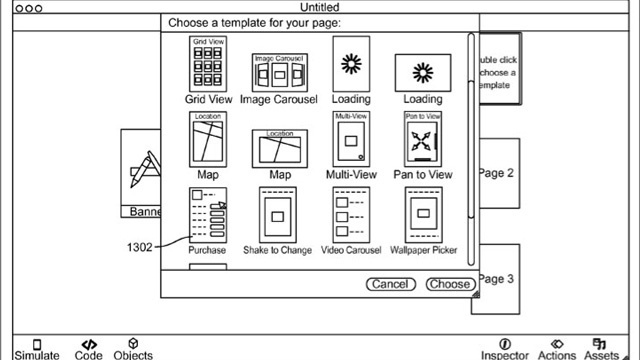 Specifically, the patent app (unearthed by Appleinsider this week) describes something of a “WYSIWYG” (What you see is what you get) system for app building, stating the need to make app building more broadly accessible. In many instances, computer-programming languages are a hindrance to electronic content creation and, ultimately, delivery to content consumers. Often content creators and designers simply lack the skill and the knowledge to publish their mental creations to share with the world. To begin to bridge this gap, content creators can use some electronic-content-development tools which allow content creators to interact with a graphical user interface to design the content while an electronic-content-development tool puts the computer-programming code in place to represent the electronic content on a user’s computer. Apple’s proposed authoring tool would provide a series of templates, allowing users to insert various actions and animations, like a “pan to view” function or purchase function for a checkout screen, for example. Even if a content creator successfully creates his electronic content, it is unlikely that the content is optimally configured for each device on which the user will view the content. Originally, digital content was created without having to account for device capabilities. The digital content was going to be viewed on a computer or television having a display of at least a certain size, with at least a certain resolution, if not multiple resolutions. Accordingly, it was possible to generate only one version of the electronic content and that version could be expected to be presented properly by the user’s device. It goes without saying that there would be some issues to overcome in implementing a system like this – after all, the App Store has rules about the apps it approves and Apple’s staff curates submissions to keep out the spam. But who’s to say that in some far-flung distant (or not so distant) future, there won’t be a way for users to exchange self-built apps amongst each other, sans App Store intervention? That would be an ideal way for people to build and share apps serving a temporary need, for example, like one created for a hastily thrown together meetup or event. It could also allow people to create their own personal apps which they would only share with a small circle of friends – think baby announcements, wedding apps, vacations photos, etc. Publishing these non-professional apps to the greater App Store could be an optional final step in the creation process, perhaps. As for the DIY app makers already out there, while such a system would compete with their offerings to an extent, Apple’s validation of the space would mainly serve to help their businesses grow by essentially providing free marketing about the possibilities. Now all we need is a whole new user interface for our iOS devices themselves. Given that Apple has sold 316 million cumulative units of of year-end 2011, these sad, little app folders won’t be able to keep up with all the apps created by this possible DIY app explosion.